Starting his life on the tough streets of Brooklyn, Jay-Z (born Shawn Carter) first made ends meet through hustling, eventually using his earnings to finance a career in music. His earliest recorded work was as a guest on records by his friend Jaz, but he soon began to establish his own material with the release of a popular underground single In My Lifetime in 1995. The following year he founded his own record label, Roc-A-Fella, through which he released his full-length debut Reasonable Doubt. The album, which featured appearances by Foxy Brown, Notorious B.I.G. and R&B singer Mary J. Blige, achieved gold status and reached the #23 in the charts, giving the rapper a solid foundation on which to build his popularity. After switching his distribution to Def-Jam, Jay-Z followed up with In My Lifetime, Vol. 1 in 1997, its production credits being shared with Puff Daddy. The album brought the rapper another step forward, reaching the #3 chart position in November. By this time his reputation in the rap world was firmly established, with numerous requests for guest appearances on other artists' recordings being offered. In the gap before his third album, Jay-Z released short film Streets Is Watching -- a project on which he served as writer, director and producer. The accompanying soundtrack record earned him another gold record and featured many of the artists in Roc-A Fella's stable. With his third effort, Vol. 2: Hard Knock Life, Jay-Z finally established himself at the top of the charts, aided by the production skills Timbaland and another guest appearance by frequent collaborator Foxy Brown. The title track scored high in both the U.S. and the U.K., and featured a sample from the legendary hip-hop musical Annie (well, she did come from the streets at least). In 1993 Vol. 3: Life and Times of S. Carter completed the autobiographical trilogy. 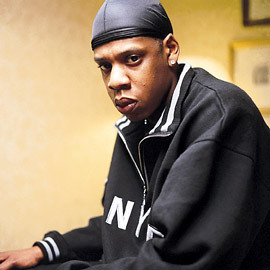 Jay-Z maintained his standing with two subsequent releases: 2000's The Dynasty: Roc La Familia 2000 and 2001's The Blueprint, both of which reached #1 chart positions. A little rain fell on rapper's parade the same year as the latter release, when he received three years probabtion for stabbing producer Lance Rivera in 1999. 2003 saw his duet with girlfriend Beyonce Knowles reach the top of the singles charts, as well as the release of The Black Album, which he maintains will be his final solo production. Announced in 2013 that he has dropped the hyphen, and wants to be known as Jay Z.